Stock up on the strawberries and cream and break out the Pimm’s because it’s that time of year again. Wimbledon is coming and all eyes will be whipping from left to right as we follow the progress of the world’s finest tennis stars. With only a week to go until the players take to the courts, Andy and Kim Murray have announced that they will be auctioning off a tennis ball signed by both the former Wimbledon champion and tennis legend Fred Perry. The lucky winner will be able to take home this unique piece of Wimbledon history marked by two Grand Slam champions, as well as a lifetime of bragging rights. Sports memorabilia is big business, especially in the digital era. As a leading delivery service comparison specialist, we at Parcel2Go.com have a keen interest in what items are being bought and sold via auction platforms such as eBay. We’re particularly intrigued by collectibles of a sporting variety. To enter into the spirit of things in the run-up to one of the country’s most anticipated sporting events, we thought we’d take a look around the world to find 6 of the most famous, and most expensive, pieces of sports memorabilia ever to be sold at auction. Considering his status as one of the most famous and greatest fighters in the history of boxing, a title that still lives on to this day, it’s unsurprising that Ali makes an appearance on this list. 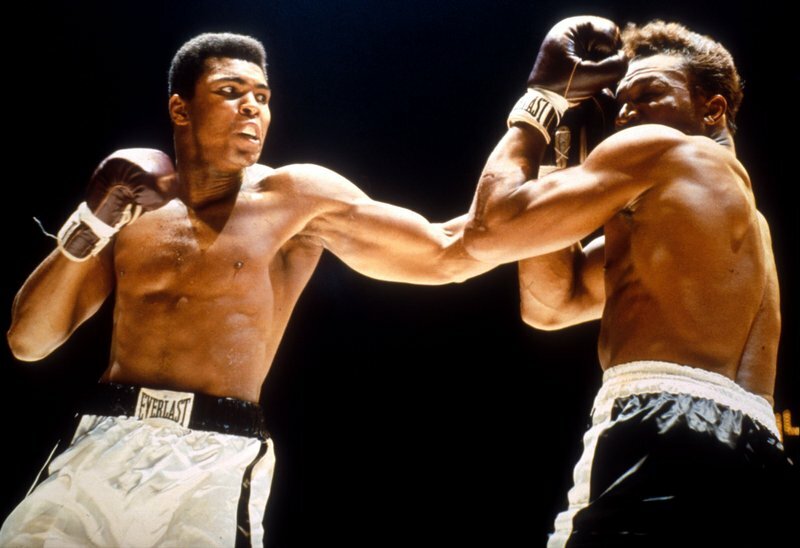 A pair of Ali’s gloves, incidentally the pair he wore in 1956 during his first heavyweight title fight, were sold at an auction to raise money for brain research at a gala held to mark his 70th birthday. The fight took place in Las Vegas where Ali defeated Floyd Patterson. The gloves fetched a staggering $1.1 million from Lorenzo Fertitta, the co-owner of the Ultimate Fighting Championship. England’s victory in the 1966 World Cup remains one of the country’s proudest moments. A vital player in that match, Sir Geoff Hurst is still the only man to ever score a hat-trick in a World Cup Final, which he achieved during England’s 4 – 2 victory over West Germany. 15 years ago, the iconic red shirt worn by Hurst during that match was auctioned to a private collector for £91,750. That may not seem like much, but over the course of the years, the shirt has seen numerous different owners, and its estimated value now reportedly stands at more than £2 million. Baseball is one of the most famous sports in the United States, second only to American Football. It should come as no surprise then that some of the most famous sporting memorabilia ever sold can be traced back to this iconic game. But not all of the sales are reserved for the hushed halls of auction houses; some even make their way onto websites such as eBay for the general public to take a swing at securing. Left fielder Barry Bonds is considered to be one of the most famous baseball players of all time, and the ball he hit during his 715th home run sold on eBay in 2006 for $220,100. Why so much? This ball is the one that moved Bonds into second place in the list of all-time home runs. Nice to have on your mantelpiece, I suppose. As one of the most played sports in the world, it is expected that the rules of football are known far and wide. But once upon a time, they weren’t so well known, and had to be written down. The Football Rule Book was considered to be the first-known written copy of rules, and the last surviving copy of the Rules, Regulations, & Laws of the Sheffield Football Club. Hand-written in 1858, Sheffield FC were forced to place the book up for auction at Sotheby’s to ensure the club’s survival, where it fetched £881,250. With so much ambiguity surrounding the current offside rule, we could do far worse than refer back to this relic every now and again. While Babe Ruth himself was never auctioned off, due to his international fame as one of America’s greatest and most loved baseball players, many of his items were sold for staggering amounts. The earliest baseball jersey known to have been worn by Ruth when playing for the New York Yankees, dating back to 1920, fetched $4.4 million at auction, which makes it the most expensive sports memorabilia ever sold. The contract detailing Ruth’s move to the Yankees from the Boston Red Sox in 1919 sold for $1 million, one of the highest prices ever fetched for a document. Finally, the bat used by Ruth to hit his first home run in the Yankee Stadium was auctioned for $1.26 million. A simple search of eBay will bring up dozens of different results for tennis memorabilia; from signed pictures to Slazenger tennis balls used at Wimbledon, but perhaps one of the most iconic pieces of tennis history all stemmed from a single picture. Tennis Girl is a famous, and now perhaps infamous poster of a tennis-playing woman in a short white tennis dress cheekily flashing her behind as she walks across the court away from the camera. In 2014, the white dress and the tennis racquet being held in the woman’s right hand were sold at an auction for £15,500, more than 8 times the predicted amount. Somewhere in the world, these extraordinary pieces of memorabilia are sitting in people’s homes, but don’t despair! Just because you haven’t got a spare couple of million lying around doesn’t mean you can’t own your own piece of sporting history. Just head to eBay and spend some time searching for autographs or other little tokens from your favourite sports heroes; you may even come across a quick bargain!